Web applications have recently emerged as a top cybercriminal attack vector, and organizations that don’t take a proactive approach to app security may be setting themselves up for disaster. More than one-third of organizations still don’t have an application security program in place – what can you do to make sure you’re protected? 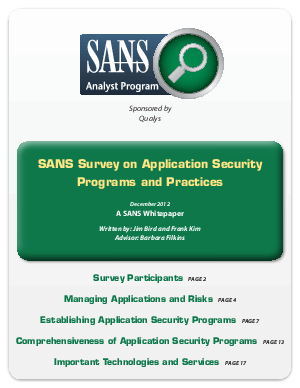 Consult this informative survey today to discover your peers’ proven practices for app security success, and learn what you can do to stay protected – read on to get started.